Stanford’s church music is very well-known, especially in Great Britain, but performances of his other repetoire are quite rare. He influenced a generation of composers, who studied with him, including Vaughan Williams, Holst, Bridge, Moeran, Howells, Bliss and Goossens. This new disc centres around his Piano Concerto No.2, dating from 1911, a work which is romantic and ambitious in scale. It begins with a tribute to Rachmaninov’s 2nd, which Stanford had conducted the British premiere of the previous year, with composer as soloist. British pianist Ben Frith, celebrated for his work in the Gould Piano Trio, has programmed it alongside neglected repertoire: Stanford’s ‘Dante Rhapsodies’, Six Characteristic Pieces and Five Caprices. The Dante Rhapsodies of 1904 were inspired by the playing of Percy Grainger (whom Stanford nicknamed “Polar Bear”) and represent his grandest work for solo piano. 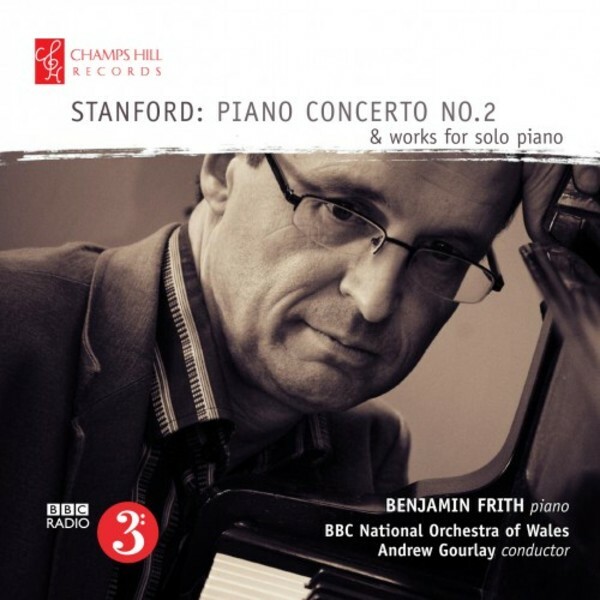 Benjamin Frith, who has a large and diverse concerto repertoire, has recorded piano concertos by John Field and with the Gould Piano Trio received critical acclaim for fine accounts of Stanford’s trios and a reconstructed piano quartet in C minor together with works by Ireland, Bridge, Scott and Bax – nominated for a Gramophone award. He is joined on this disc by the BBC National Orchestra of Wales under the baton of Andrew Gourlay.